Apply for various accounts in our UP-Ayala Technohub, Commonwealth Ave and Tera Tower, C5. Easy accounts, healthcare, finance, tech accounts and more - let us know what you prefer! Click on link and be interviewed via phone. Looking for a WEEKENDS OFF account? Join our Healthcare Account in UP Technohub or Tera Tower C5 site and enjoy fixed Saturday & Sunday off! Click here for a phone interview: APPLY NOW! Or visit us at G/F Building F, UP Ayala Land Technohub, Commonwealth, Q.C. Or GF Tera Tower, Bridgetowne, C5 E. Rodriguez Jr. Ave., Q.C. near IPI Terminal and Pasig Rosario Bridge. Indicate PINOY EXCHANGE/ONLINE as your source of application when you apply. Apply as CSR for our UK Telco Account and Get Instant Gift Certificates from us when you apply in our Cubao site! High school grads are accepted, no work experience required! Visit us at 3F Spark Place, P. Tuazon cor. 10th Ave., Cubao, Q.C. Across SM Cubao & Ali Mall. Make sure to indicate PINOY EXCHANGE/ONLINE as your source of application to claim the GCs. 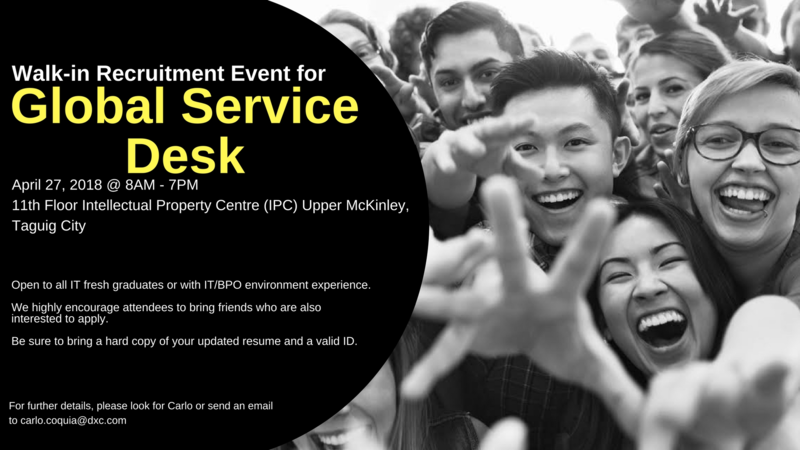 Cobden and Carter International is partnered with a BPO company that is looking for Customer Service Representatives for their TRAVEL ACCOUNT this will be based in their Alabang or Taguig site. Okay with shifting schedule and night shifts. Let us help you start your dream career! Hello #jobseekers! Our company is in need of 100 Home-based and Office-based Teachers. American Express Business Engagement Advisor - P41,000 package above. Shift and Schedule: PERMANENT DAY SHIFT (Australia time) and weekends off! Plus enjoy the flexibility to WORK FROM HOME. Hi! I'm looking for a company that can give me an offer from 25k to 28k all in package. 5 years exp handled DTV tech Uverse tech and ATT mobility retentions. Thanks! Wanna work for CONVERGYS San Lazaro AND get a new motorbike? * In need of 5 APPLICANTS that will pass recruitment process - WITH OR WITHOUT CC exp (at least 2nd yr college) and all of us will get a new motorcycle!!!! Greetings from MatchPoint HR Solutions, Inc.! 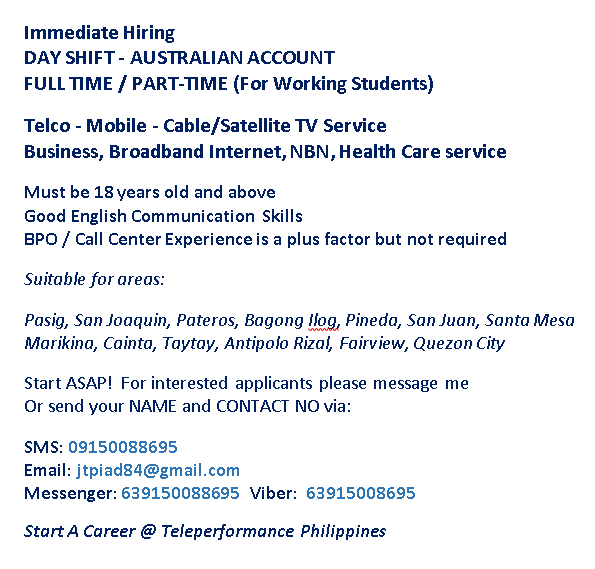 WE ARE HIRING para sa isang LEADING PROCESS OUTSOURCING COMPANY. Just send your resume and photocopy of your active PRC license to [email protected] for pre-qualification or visit our company's website at www.revupoint.com for information about our Company. Greetings from The VA Hub!  Strong work ethics. Are you self-motivated, collaborative, confident, intelligent, and assertive? Send your resume to [email protected]. Thank you. Hello PEXers! For those who are currently looking for a job or planning to start a career in the BPO industry, you may want to check out Onehalf PH as they are currently looking for talents who can be part of their growing Customer Service Representative team. You can check out http://onehalf.net.au/aboutus.html for more information. Analyze client software license purchase data, perform reconciliation and remediation tasks to ensure data accuracy and quality. Process and maintain client software activation files, legal agreements, and maintain customer’s entitlement data. Conduct software license research to support sales teams on new sales and contracting requirements. Provide regular feedback to sales, partners, and customers, on data. Provide end user functional support on the use of activation files. Support presales and implementation activities on new client engagements and projects. Provide feedback on internal operations to improve the delivery of services. Knowledge of general IT operations, operating system management, databases and integration is a plus. 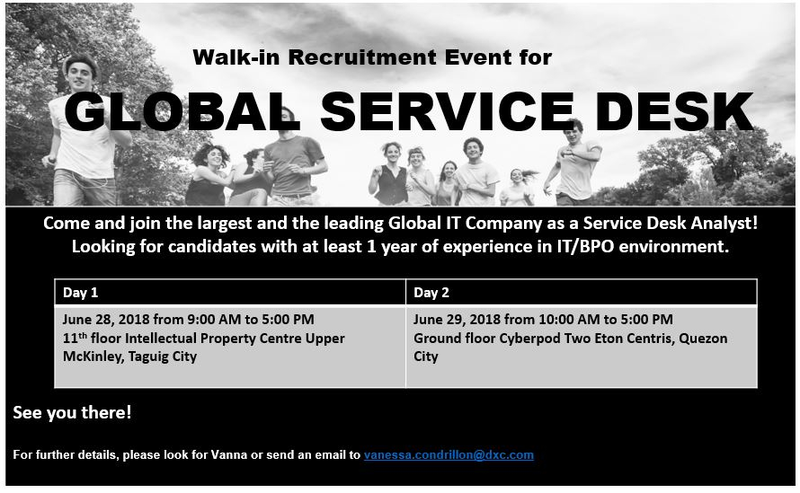 Kindly bring an updated copy of your resume on the locations presented on the picture. Onehalf is still hiring fellow PEXers! You can check their job openings at http://onehalf.net.au/. They have dayshift account and weekends off. Working culture as well as the people are awesome here! I guarantee you won't regret to be part of their team!